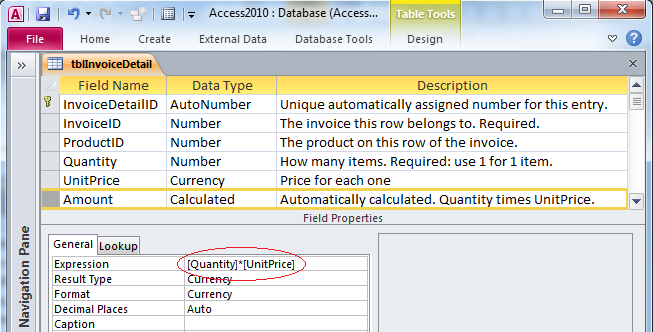 What about Calculated fields in Access 2010? Just choose Calculated in the data type, and Expression appears below it. Type the expression. Access will then calculate it each time you enter your record. Even more serious, the calculated results are not reliable. If you change the Expression after data has been entered into the table, the existing results may not be updated correctly (through new records are edits are updated), so you cannot rely on the results. A compact/repair does not recalculate, so there is no obvious way to repair the bad results. Since you cannot index calculated fields anyway, there is no performance benefit to be gained from using them. You are violating fundamental rules of data normalization for no good purpose. We recommend you use queries for calculated fields, just as in previous versions.